macslad, sorry, I saw your message just now. I sent you a PM in case you're still looking for help. Good news! I got my EEPROM chips today! I'll post some pics to illustrate the process (just showing off my new USB "microscope", really... ). It's an M24C02-W, which is rated for 2.5 to 5.5V. 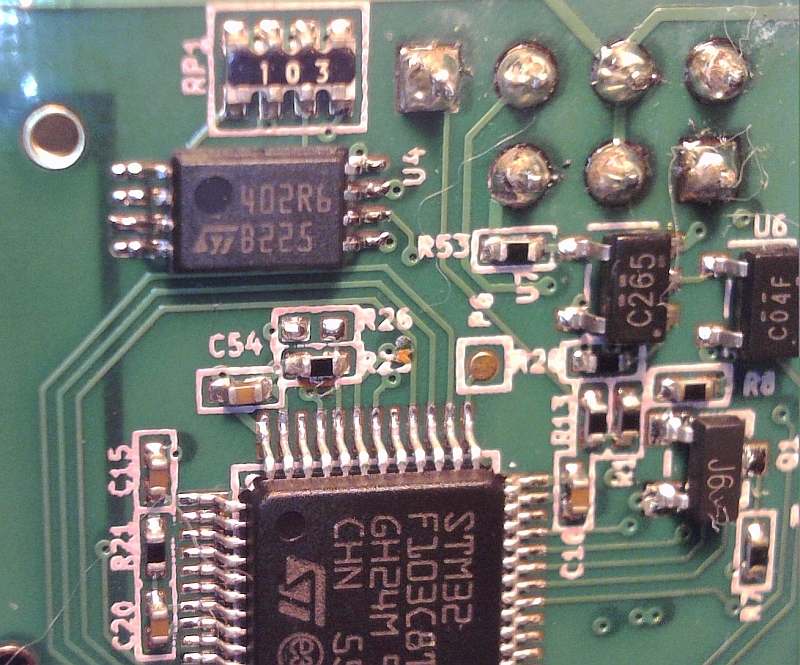 FrSky told me the chip should be M24C02-R, which is 1.8 to 5.5V. In fact, I don't think it makes any difference, since MCU voltage is 3.3V and that's the voltage that should be feeding the EEPROM as well. Anyway, the new chip will follow FrSky's recommendation. I switched it on, and ... no more annoying beeps! Everything works, the module is still talking to receivers, and telemetry is Ok, too. Guess what! Last weekend another hobbyist came to me with exactly the same symptom on his XJT. The module beeps without any reason! Also, there's at least one YouTube video showing the same issue... So while it is not a widespread problem, it's not a unique case, either. I hope my experience will be of help to others. BTW, I have plenty of these memory chips now. PM me if you need help getting the parts or fixing your XJT. Got the same problem with my 2 XJT modules. Can you help me getting the M24C02-R chips? Please send me a pm. I have XJT with the same problem. I try to repair it for my friend. 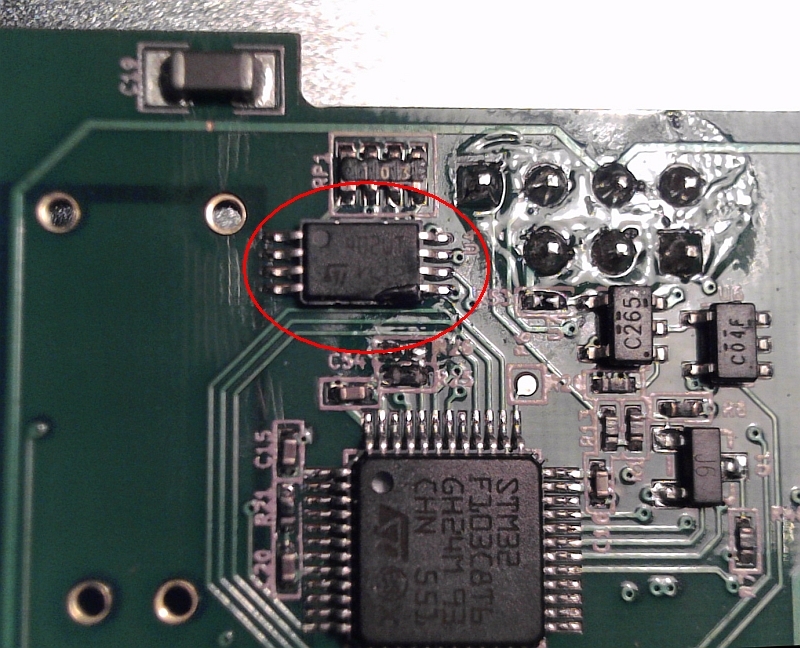 Replacing eeprom is easy for me. And should there be something written in his memory? Hello, I have the same problem with my xjt module on flysky th9x. I also encountered this beeping. I have two XJT module (I got an additional one for warranty issues, but that's another topic), and I have a Turnigy 9X radio with OpenTX firmware without the FrSky Telemetry mod. So basically I just changed the stock module with the XJT. First I played with binding the receivers, etc. I found some errors, that the X8R receiver doesn't provide the correct channels on the PWM outputs as described in the manual, and doesn't provide analog RSSI on its output. But this part is offtopic. But because of this errors I decided to upload the er9x firmware to the radio to see if driving the module only with PPM signal can cause such errors(there is only PPM in the OpenTX fw.). In the setup I could find that I can change the PPM to the XJT mode(I assume this is the PXX). And after I pushing through the options, there was DSM2, PPM16, etc., it started this disgraceful beeping. So initially it was okay, it look like the different signal modes drove it crazy. I tried to communicate with the module on a serial line with the eePe software. It could read the RxRSSI value, it looked normal around 80-90, but the other values(TxRSSI, A1, A2) were all 0. I set an alarm for a higher RxRSSI threshold, for example 100, and it immediately responded with beeping, but on a higher pitch. I could disable it after then. So maybe the wrong signal mode could brake its soul, or maybe that I didn't make the telemetry mod and it couldn't communicate with the radio. So I don't know exactly what caused this beeping. I even set back mode to PPM, even uploaded the 'original' OpenTX firmware, but it never stopped beeping. Oh, one difference I made: Mike said the eePe should connected in D8 mode, so I will try it in the evening. I have one important clarification for XJT module. In my experience, after installing the new chip M24C02-R, you must re-bind RX to TX. I also just experienced the obnoxious beep of death from my XJT module...I'm so glad I found this thread. I ordered 10 of the proper EEPROM ICs as soon as I read this. Not all electronics suppliers I checked had them available in the TSSOP8 package, and I felt weird buying a single 5mm, 12 cent IC and paying $6 for shipping. So if anyone else runs into this problem, I can send one out for you. I have 9 left over. Altogether replacing the IC took about 5 minutes, though if you don't have experience with SMT rework, it may be better to find someone to do it for you. I had my XJT working again just 15 minutes after receiving the parts in the mail. One note...a few of the pins, #2, 3 and 4 (E1, E2, and Vss) are bridged by design. 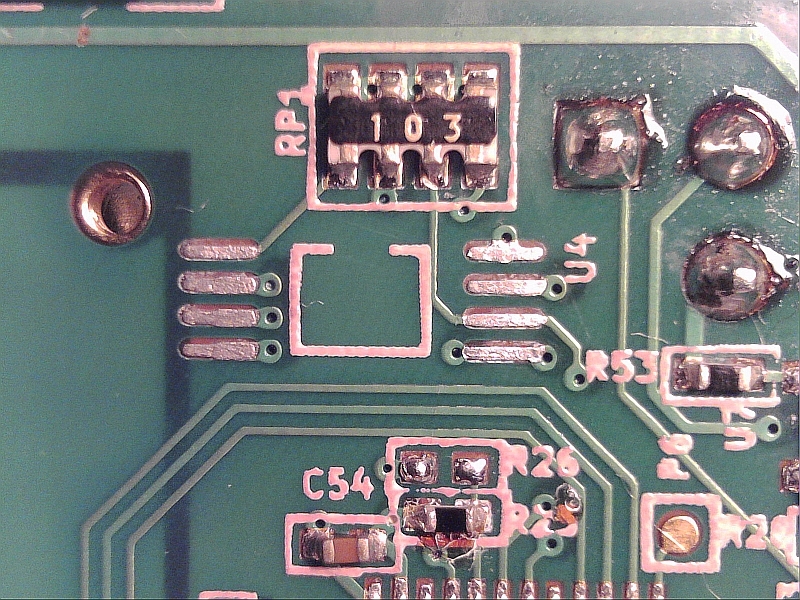 I had to get the datasheet to make sure I didn't have a soldering mistake when I checked for shorts and found continuity between those pins. Maybe I should have investigated a bit more before desoldering the original, but the datasheet cleared up my confusion quickly when I couldn't see any problem with my soldering. 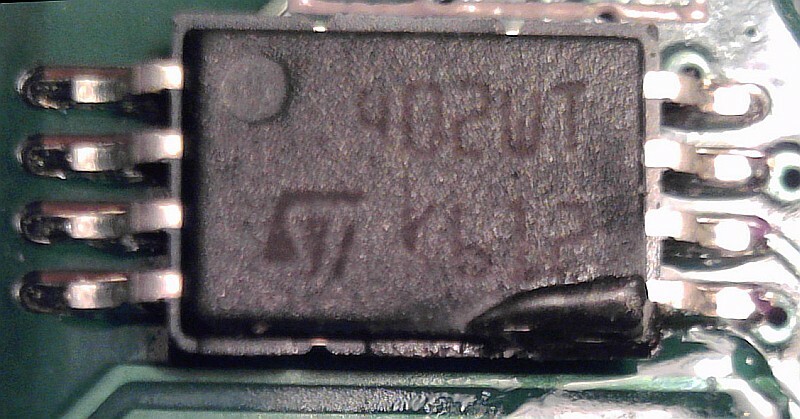 Note that you have to be very careful when doing that, if you're replacing the eeprom you will have a transmitter ID that will be the same as anyone else having done that, so if you're at the same place than someone else who has done that you will likely be controlling each other's models.. I can read RxRSSI in eepskye (about 100-110 or 86 when antenna is covered by hand), other metrics are 0. EEPROM seems fine, because I can change warnings, save them and then read correctly. I use old radio - FlySky TH9X without telemetry mod, but with er9x firmware. @Tibor, were you able to solve this problem somehow? I have two XJT modules with different problems, but I only want to deal with one of those modules here. One of my modules started this beeping constantly mid-last year, so I bought another one, which solved the problem, obviously. My beeping XJT beeps whether it is in my 9XRPro or my QX7 and it beeps whether the Rx is powered or not - all it requires is power on the Tx. I tried to re-flash it but my ErSky9x in the 9XRPro couldn't 'find the device' until, instead of starting it with the module installed in the TX, I started the TX with the module removed, then started the re-flash process and installed the module when the program in ErSky9x said Finding Device - it then found the device and completed the re-flash of XJT_141016.frk without the beeping sound. However, after a power-cycle, the beeps returned. Everything else seems to work with the module - servos move on the Rx, etc. A second XJT module and also a DJT module (just for the thought) does not have the problem, in either radio (the XJT has a different problem, not for this thread). I don't have a single computer with a serial port nowadays, but I guess I could buy a USB to serial adapter and try to re-set the D8 Alarms, as Mike B. suggested elsewhere. But, maybe this EEPROM is the problem? I do not have SMT skills or tools. I can probably buy one (or more) of the chips here in Australia, but I don't know anyone who will easily replace one chip on a module that they didn't sell (I bought online). Is there anyone here who knows of any hobbyist in Australia who already has these chips as spares and who can do that repair for me, for a price? The cost off sending it overseas and return, plus repair costs, likely outweighs the price of a new module from HorusRC, I think. Or, since I now have 2 defective XJT modules, is it time for a third XJT module or change to someone elses Multi-protocol module and give up on FrSky XJT units? Last edited by ozphoenix on Tue Feb 05, 2019 9:27 am, edited 1 time in total. When the XJT is operating, but beeping, what is the SWR value? FrSky are on holiday until Feb 12. Holding the radio in my hand with the antenna away from me, SWR=0. Closing my fist around the length of the antenna, SWR ranges from 15 up to about 32, depending on how much of the antenna is covered and how tightly I hold my fingers in the fist around the antenna - more and tighter gives higher SWR readings. Any feedback about my SWR readings? Set the DIP switches on the XJT to D8 mode. You will need to power the XJT, using it in the external bay of a Tx should work fine. Next connect a serial port (full RS232 output) from your PC to the "D8" telemetry port on the XJT. Run eepe or eepskye and select the Telemetry menu, choose the COM port and select the "module" tab. Click the "Start" button, then click the "Read Alarms" button, the alarm settings should be read and displayed. If any are set, simply change them to "disabled), then click the "Write Alarms" button. It might be a few weeks before the adapter appears at my place, but if that fails to correct the problem once I get it, I will buy a stick of the EEPROMs and find someone to replace it for me locally. Your SWR values are what is expected. SWR is a measure of how good your antenna is working. So when you see "0" this is good RF signal output to the antenna. When you see a higher SWR value of 15 and up, this is a worse RF signal output to the antenna. You want to see "0" for best, meaning it is working good. PXX protocol (XJT setting) is where you get the SWR reading. It is not the same as the PPM (D-series) protocol where you get the TSSI readings. Thanks, Mike - it is as I thought - just wanted to be sure that it did't point to other things for you. I'm hoping for the USB-to-serial adapter in the next 7 days - will see if that helps solve it. Thanks, Bob, for the added detail -- always helpful to all to have extra info. Please see my response to Mike - I thought the readings might point him to something else as a likely suspect. I'll now wait for an adapter to test out the 'D8' alarms. FrSky did have some early troubles with there internal XJT modules in there earlyTaranis radios. I had one that I sent in and was repaired (works good now ). which have never showed any problems at all. XJT external with LBT firmware-flashing problem: (viewtopic.php?f=123&t=8869&p=125694&hil ... ng#p125694). that it may be possible to flash the XJT module to become a multimodule. This could/would be a good thing to be able to do with the erSky9x firmware. which would be cool if we could flash it to be a multimodule. And so it would be cool to be able to flash DJT and/or XJT the modules to be multimodule. May even be better with the XJT module so to have S.Port telemetry with it also. But why? the advantage of the multi module is that it works with several different protocols. The DJT and XJT only have one RF chip.. The multi module has 4.. I did did not know that (multi 4 RF chips), good point ! Well, my USB-to-Serial Port Adapter arrived and I made a cable to go from the DB9 serial to the inline RS-232 connector on the back of the XJT module (omitted the +5V, only included Tx, Rx, GND). With the module continually beeping, I did a fresh BIND in D8 mode on a D8R-XP receiver with one servo attached and then checked servo operation - all good. I started the latest test version eepskye and was able to connect to the XJT module and see all settings and read seemingly reasonable (and fluctuating) A1, A2, TxRSSI and RxRSSI, etc. I can set alarms to different settings and write them, read them back, exit the program, power cycle everything and the settings have remained as I set them. I have now left them all in the 'disabled' condition. The whole time, the beeping continued, though it was erratic in tempo, changing speed occasionally, but always continuing. So, unless someone can point me in another direction, it seems that my next move is to find someone with some EEPROM chips and the ability to change one for me, as I have neither the tools nor the steady hands and clear eyes nowadays. Or, otherwise, send the XJT to FrSky for them to repair, out of warranty. Though, not sure if they offer that service, even in China. Found some chips (locally in Oz -1 week by post), found a local clubmate who can do the work - will see how it turns out in about a week or so. My chip and spare arrived yesterday - hopefully, I can pass them along to my clubmate to make the change in the next week. Will give feedback on the success or failure, once that is done. hi everyone! this is another issue on xjt, (a beginner"s concern )i heard from one flyer that the xjt module can operate remotely or away from the radio (my radio is 9xr pro)is this true? if so how can i do it? i really need this kind of connection for i live in tropical country where the sunlight can hit you like an oven, so i can place my xjt and antenna in more elevated position w/out the direct heat of the sun and prolong standing. anybody pls.